Astellas Transplant, the pharmaceutical manufacturer behind the transplant drug PROGRAF, requested the development of an "eDetail" while during my tenure at Kane & Finkel Healthcare Communications. 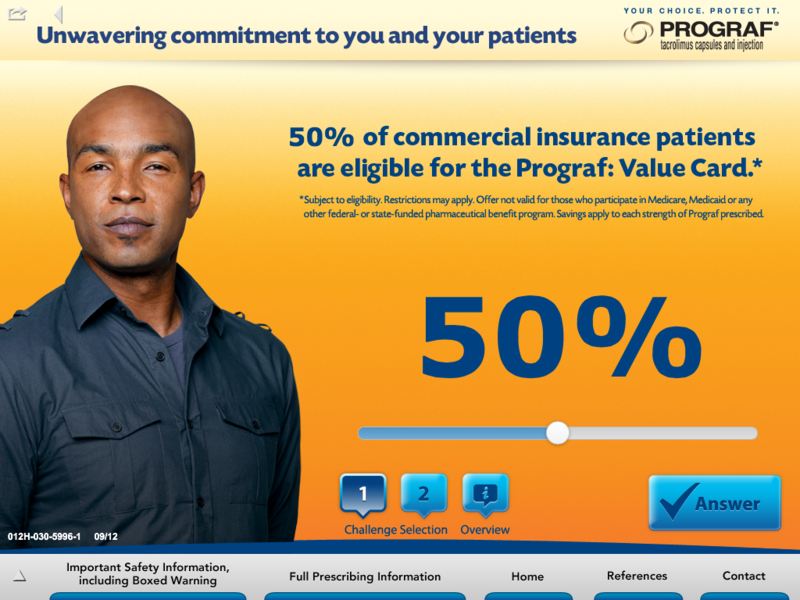 The company's sales representatives needed a more interactive way to educate health care professionals (HCPs) about the benefits of PROGRAF and opted to pursue an interactive application. The app went through two transformations, with the first built with Adobe Flash and used on a tablet computer with limited functionality. 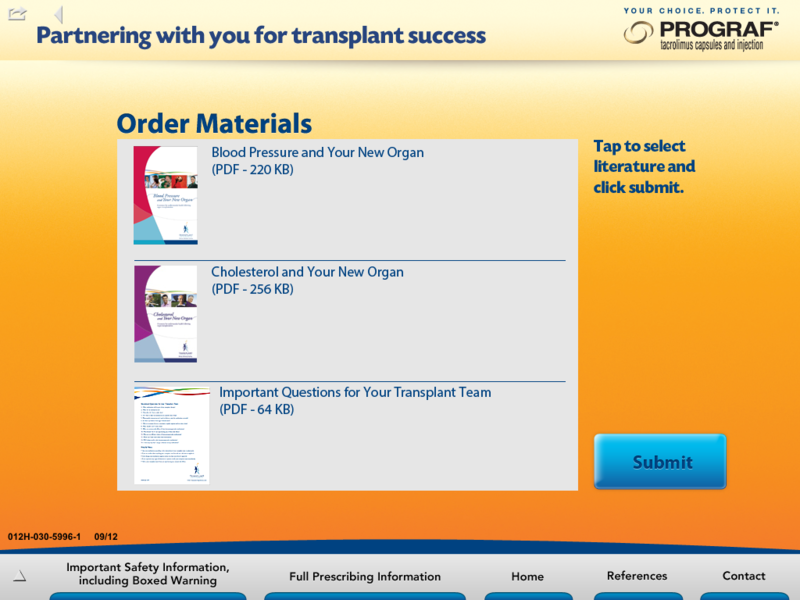 The final version was developed for an iPad and featured numerous sections, quizzes, information, and resources that the sales representatives could use to provide to HCPs. At the end of the sales visits, HCPs would request specific brochures, pamphlets, or additional information right from within the iPad app. 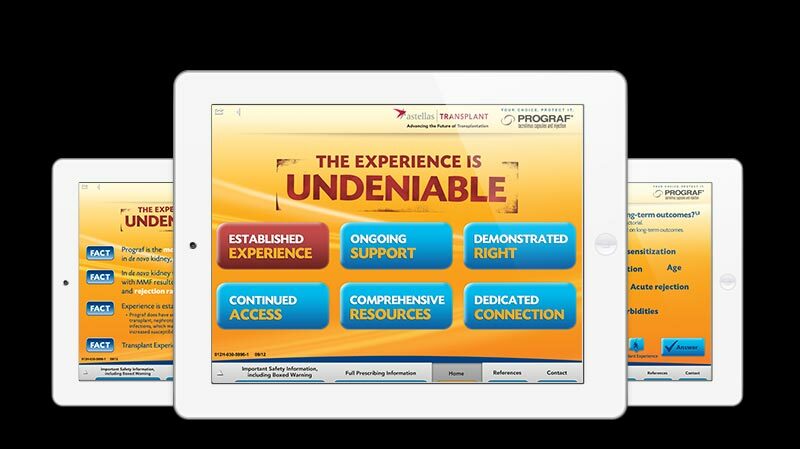 With the iPad eDetail, the app was divided into six sections, with the first four centered on PROGRAF's benefits. Within each of these "Undeniable" sections, we produced three challenge questions to test the physician's knowledge and understanding of the drug. The last two were places where sales representatives could show additional resources and get physicians to sign up for more information. As the interactive producer, I worked alongside the agency's designer, developer, copywriter, and account team to craft the user experience (i.e., what physicians would experience when using the app). We also integrated this eDetail app into the Veeva Customer Relationship Management (CRM) product and be powered through Mobile Iron. Functionality was also built in to allow some customization options for sales representatives. 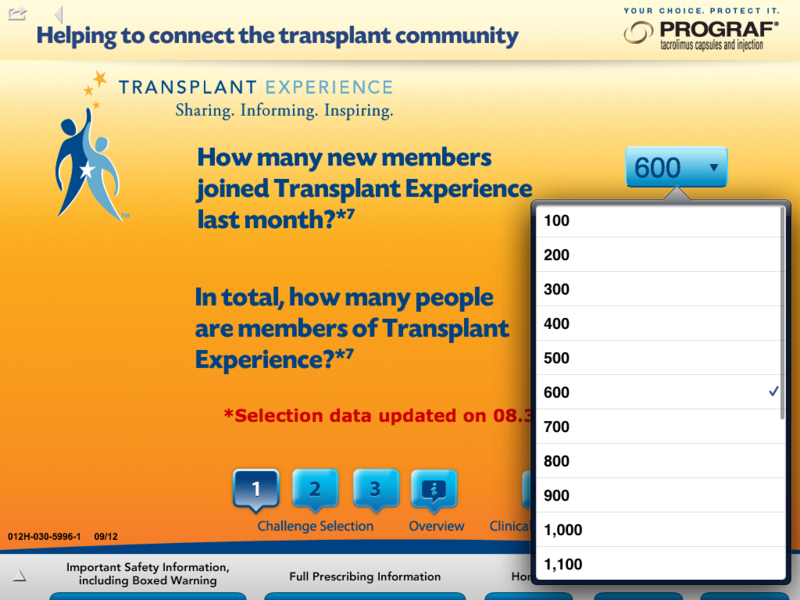 All activity was tracked and recorded on private servers and provided to Astellas Transplant so it could analyze responses to the survey and gauge how well HCPs knew PROGRAF. Based on the requirements of Astellas Transplant, I wrote the functional specifications document detailing how this iPad app would work, managed the entire development process, liaised with Veeva to ensure proper integration, performed Quality Assurance testing, and helped the account management team ensure the app's successful passage through the regulatory approval process.